If you haven't already done this, go into the Chip8View.h file and make sure that Chip8View inherits from NSOpenGL View. I'll also make a few class variables that I'll use. Build and run the project - If everything is set up OK, then your window should be displayed and filled with a dark blue color. If you don't that, something went wrong with your project setup - double check the instructions, or compare against my final code. Now that we know everything is working, I'm going to go modify drawRect to display the game's image. First this code will expand the 1 bit per pixel (BPP) game image to 8 BPP. Then it creates a texture. Finally it draws one textured quad that fills the view. The view is set to have an orthographic 2D projection where the x and y coordinates are both have a range of -1.0 to 1.0. The GL_TEXTURE_ENV_MODE is GL_MODULATE. We could colorize the pixels by inserting a glColor3f() command just before the draw. In the initWithFrame above, we allocated and started a timer. Make sure to implement timerFired to trigger a the view to redraw. We already implemented the rest of the keyboard handling in the machine object (and the emulator). In the code you download, I implemented reshape so the view always retains aspect and expands if you resize the window. Take a look at that if you're interested. 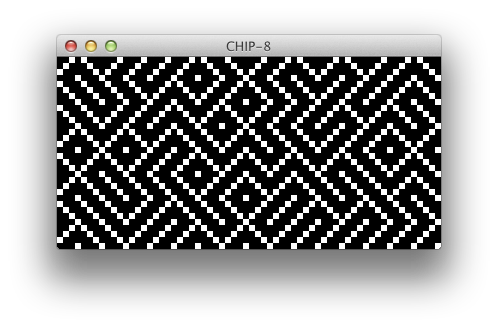 View my CHIP-8 emulator source for OS X, XCode 4.2, tested on OS X 10.7.